The mallards are staying in a particularly tight group this morning. But there’s probably little if any thermal gain for them in huddling while paddling through a sea so cold that the fine slurry of snow on its surface hasn’t melted yet. Fat flakes settle on the lone heron as it looks on, impassive, from its perch on the central rock. Stock-still, hunched like a crone, its grey shawl waxes paler by the moment. Snowflakes are coming straight down now. The north wind that yesterday had whipped them up in dancing eddies, plastering them to the glass, has died away. Sporadically, branches on next door’s apple tree move a little, but only due to their bending and recoil from the snow bearing down on them. Another swoosh and thump as a slab fractures away and avalanches from the roof. It’s been happening all night. Those sudden commotions in the midst of such tinnitus silence were a little startling. I’ll be fixing gutters come the milder weather. Oyster? Pearly? The grey obliterating the mainland mountains is cold of content but not of hue. There’s a subtle pinkness to it. 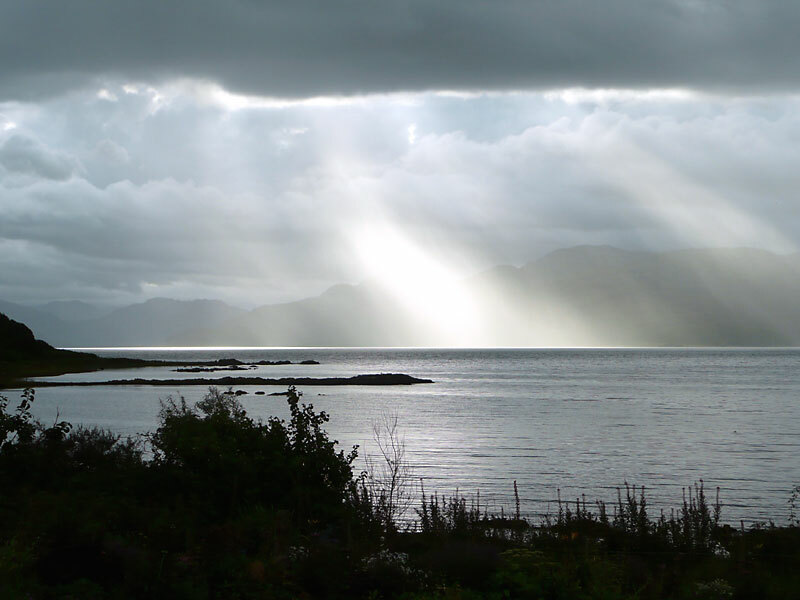 A brightly-coloured fishing boat trawls slowly down the Sound as the veil lifts behind it, revealing tentative foothills. Now the contrast is turned up while the colour drains; it’s a pin-sharp pen and ink landscape, impossibly, mathematically detailed. Scrubby trees as dusted fractals. Slow, sine waves. A brimming, binary scene. And just as quickly, the pastel’s back. Now a smudge of wan, yellow sun, gently gilding the sand. Such beauty, intended for no one. Just there, dawning. Cool blue and brilliant yellow-orange; smooth-rippling, lapping, gurgling; craggy and frosted. Closing my eyes only intensified its impact. I could still see it in my mind’s eye (and imprinted on my retinas). And the sounds sharpened, the chill of the rock beneath me penetrated more deeply, the salt-cold tingled more refreshingly in my nostrils. And – also deeply refreshing – no meaning. No meaning that I was sitting there, observing, as my location tilted into the path of the nearest star. No meaning that this vista has been spewed forth and subducted, thrust up and ground down, bathed, frozen and parched, over billions of years. No meaning when it is all lost to entropy. As I walked back (in my ill-chosen footwear) a sussurus of wings grew in volume to flutter, flap and swoosh as the mallards ditched by the water’s edge. One unusual collective noun for a flock of flying ducks is a ‘plump’. But, to me, that’s more like the sound the stragglers make upon impact with calm water. 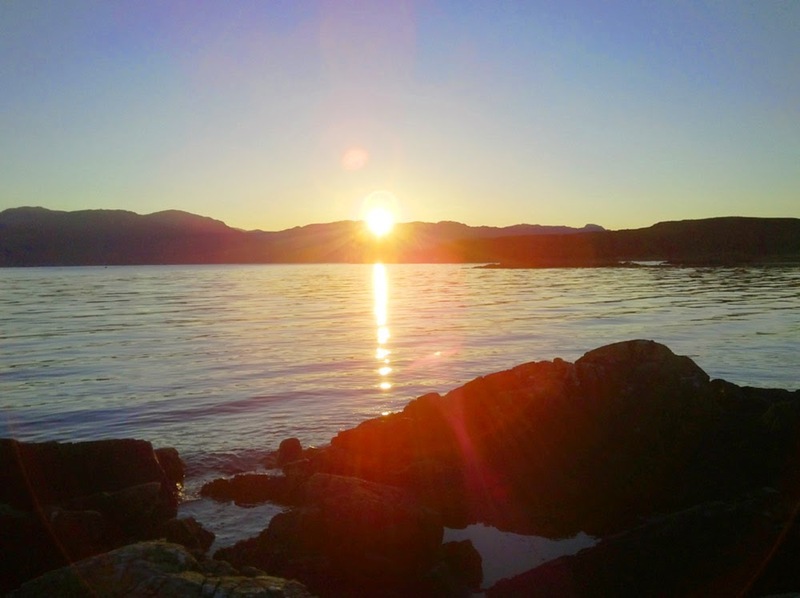 How many sunrises does it take to fully wake a man up? Who knows? For some, maybe just one. For others, more than a lifetime’s-worth. No matter, it’s a stunningly meaningless morning. 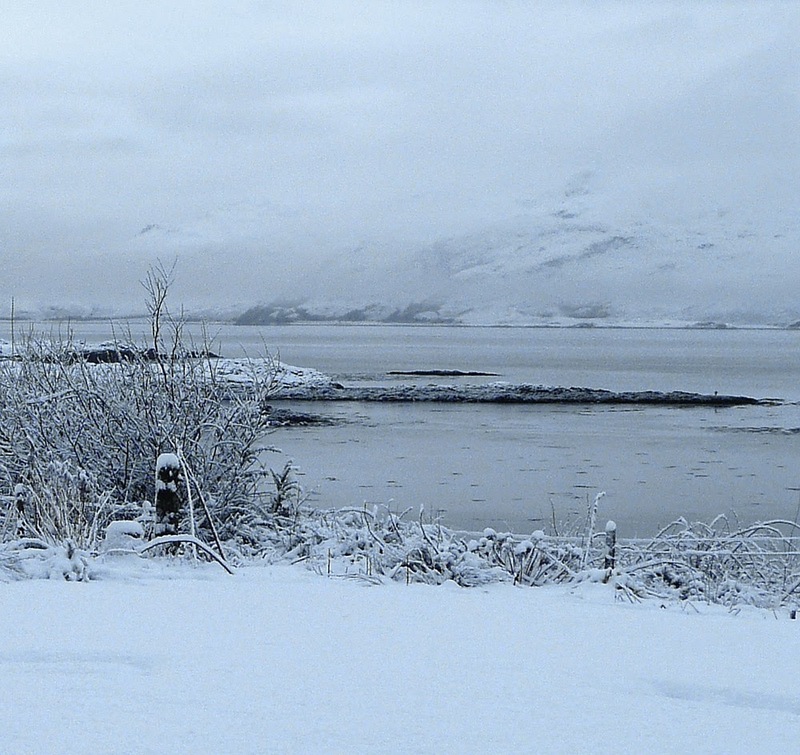 It’s dreich and midgey – the worst kind of Highland summer weather. Dreich i.e. overcast, drizzling and as dead still as a Raasay Sunday; midgey i.e. swarming with clouds of Culicoides impunctatus. You can’t get anything done outside when it’s like this. Midge hoods and anti-insect sprays help a bit, but, inevitably, you still end up getting bitten (a lot) and having to retreat indoors in irritable, itchy-lumpy defeat. And no, you don’t get used to them, even when you have lived here your whole life. There are, however, some minor compensations. 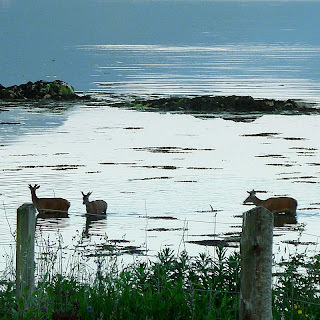 For example, the long, calm and quiet dusks bring out all kinds of twittering, chirruping, grunting, bellowing wildlife; and the sea is either mirror-flat, or smooth-rippled like old glass. Our camera tends to put a cyan cast on photos, but with the overcast skies and, as a result, the strangely filtered light, the entire land and seascape really does have a very strong cyan cast these evenings. Some of the local red deer (Cervus elaphus) population have been getting increasingly bold. Even the noise of shotgun blanks, fired by one of our neighbours, fails to scare them off. Some of the deer (juvenile or female reds, we reckon) have taken to crossing Gastrobeach at dusk. We didn’t find this too unusual at first, as we have seen them on the shore previously. When I took this photo, however, they were wading across it at near high tide. We have now seen them doing this several times; one of them was actually swimming, rather than wading. It’s very pleasant to watch them seasoning themselves in this way (only kidding). Not, of course, that I don’t love venison. Red deer are now abundant here, so you would think that venison would be easily available from local shops and cheap to buy. Unfortunately, that’s not the case, and venison is still considered a luxury food. They are certainly graceful animals. And they’re welcome to the shore, where they pose so elegantly on these still, filtered evenings. Anyway, I’m sure many local gardeners are much happier to see them down there than up here decimating their vegetable patches. Last weekend, our neighbours were kind enough to invite us over for refreshments. Well, we were really just supposed to be going over to pick up some courgette plants, but it turned into one of those evenings when the talk and the alcohol flows freely, and where an hour stretches into three or four without your really noticing. Our neighbours have a beautifully-well-kept vegetable garden -- my mother described it as being like a market garden -- with a large polytunnel, enabling them to grow all kinds of veg that would otherwise struggle in our sometimes-harsh climate. While drinking (in both senses) in the sun -- ladies on wine and gents on refreshing beer -- we got to talking seafood; they too have a good view of Gastrobeach from their house, so they've seen me down on the shore swimming and foraging (though not at the same time). Before I knew it, there was a tub of Islay oysters on the table, with chunks of lime to go with them. I don't know about you, but that's my kind of evening: sunshine, shellfish, a few drinks and (at least initially) smart conversation. We went home with much from that evening -- not just the washed and bagged lettuce and mange tout, not just the courgette plants, not just the satisfied belly full of beer and oysters, but the sense that good company and a wonderfully-relaxed atmosphere are sometimes closer than you think. The ever-expanding array of Christmas decorations may be packed away in the loft until next year, but I'm not ready to kill the lights just yet. As I have no religious inclinations I celebrate Christmas in the ancient way - as a time for family, fun, feasting (and a little drinking), but also in the other old sense of being a time to light up the winter darkness. My ancestors, lacking LED technology, would have done this with blistering bonfires, and with torches made of bound-together twigs or rags soaked in animal fat attached to stout sticks. No such trouble is required to fend off the winter gloom these days, which makes it all the more odd that most people insist on removing every trace of festive illumination the moment 'twelfth night' arrives. I do try to keep this continuing effulgence subtle. One string of 'warm white' lights adorns the crab-apple tree outside, and the 'bright white' Christmas tree lights have been relegated to a large glass jug I have placed on a shelf near a plug socket. On a more serious note - winter darkness can have a serious impact on mental and physical (all the same thing anyway) health. Don't be put off lighting up your life by daft conventions about removing all that stuff, when you could keep at least some of it in place to help to cheer you up in the dark months. Cinnamon-laced coffee now plunged and steaming away in my new Roland TB-303 (Bass Line) themed mug, I look forward to the remainder of the flaky hot-smoked salmon which I will be having for lunch. It's properly dreich out on Gastrobeach today. At least the mountains are visible as I view their grey bulk through the reflection of my jaunty light-jug. The attached photograph is from a walk we took on one of the few dry days. 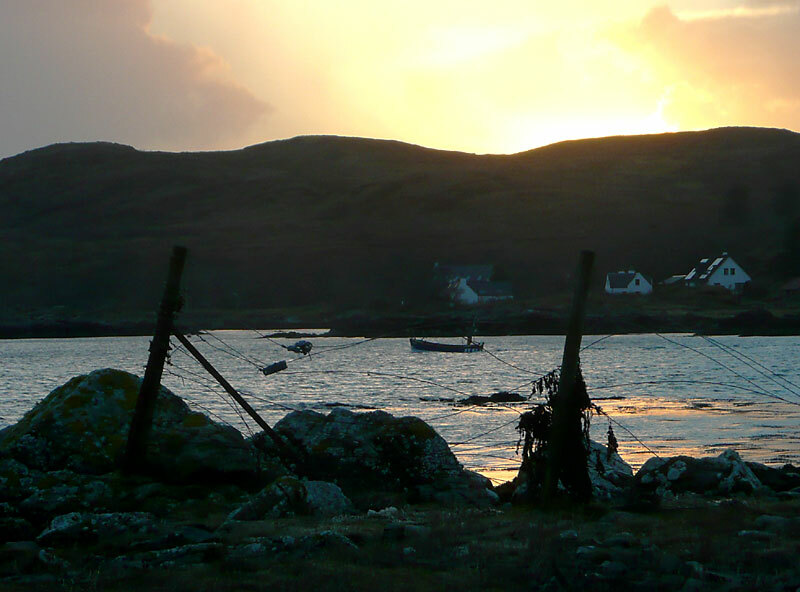 My wife captured the image - a creel-boat heading out of the bay at sunset. I wish you a Happy New Year but at this moment I particularly wish you a happy January and February. And if their days can't be merry, then at least make them bright. The fascinating organisms pictured, are goose barnacles. We found them, while on holiday, washed up on the otherwise uniformly empty and sandy shore of Boyndie bay. 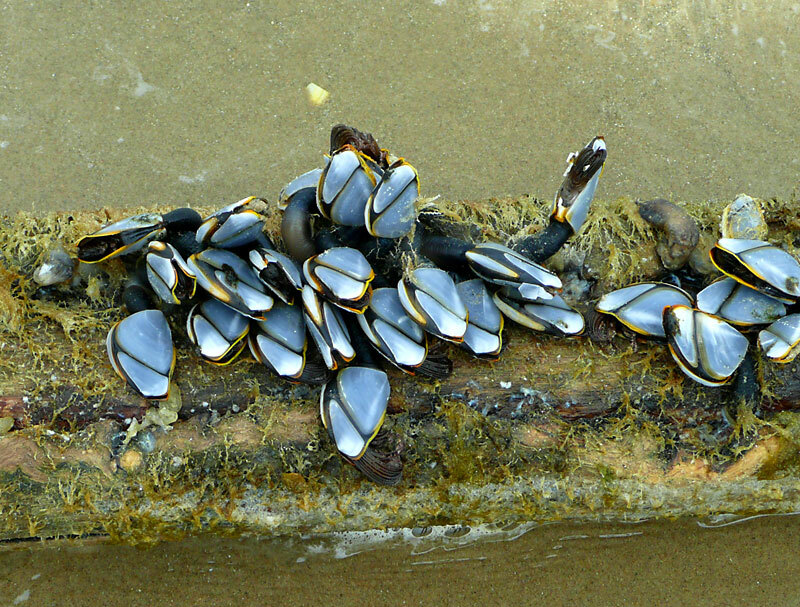 We had never seen goose barnacles before and found them quite beautiful, if a little alien. Although we didn't attempt to eat them I wondered if they would be anything like the barnacles that the Spanish, particularly of the Galicia region, risk life and limb to collect from wave-battered rocky inlets. Because of the great difficulty and danger involved in collecting them, the Spanish variety - known as percebes - fetch premium prices in their bustling fish markets. It looks like the ones we found were the pelagic gooseneck barnacle variety Lepas anatifera. The stems of these are, apparently, edible. But, because the stems are so thin and not very meaty, they would probably just be a load of messy hassle to prepare. The Spanish variety, in stark and expensive contrast, are apparently simple to cook - just boil up for a few minutes in some sea-water - and deliciously salt-meaty. Just be sure to pull the crunchy head off. I have just read, with some incredulity, that goose barnacles are so-called because it was thought in the (I hope distant) past that Barnacle Geese developed from them! Tiny geese, spontaneously erupted from the driftwood, one day to fledge and take flight: charmingly naive notion on the one hand and disturbing autogenesis-like concept on the other. Well we did say they looked alien.